One morning, on the way to work, the London Underground proves to take Niall Peterson to his limits - a suicide next to him, closures, disruptions, stressful phone calls to his ex-wife... no wonder he has a heart attack. Then he wakes up again, revived by a grey-haired elderly lady, and nothing will ever be the same again, for now he is one of the Fey, the Fair Folk, the Others, the mythical, magical races from stories. 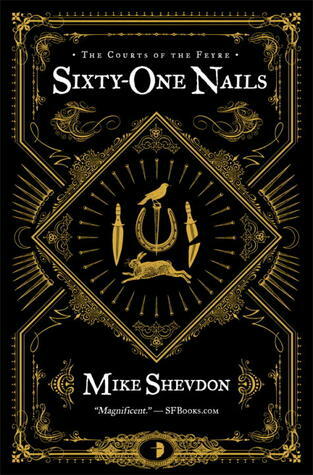 Sixty-One Nails is a novel of urban fantasy set in London. Few cities inspire as much urban fantasy as the big smog, and Sixty-One Nails is one of the better novels set here. The atmosphere is often rich and engrossing - if Hellboy 2: The Golden Army was to your liking, or perhaps Rivers of London by Ben Aaronovich, then chances are, Sixty-One Nails will be a pleasant experience, too. Being the first novel in a series, we basically spend most of it learning the rules, receiving exposition, and following Niall as he stumbles from one enigmatic, secretive mentor figure to the next. A lot of thought clearly has gone into the meshing of myths and urban world, and it is well executed. However, the novel disappoints a little on the editing. A lot of the dialogue is a bit clunky - treading the same ground several times over in quick succession, with repetition, questions being asked and answered the same way several times in the same scene. The amount of repetition is quite grating - it's as if the author needed to get some exposition delivered, had a go at it, wasn't quite happy, had another go, was happier, then decided to reinforce the point by having yet another go, and then, after delivering the same tidbit of explanation/exposition three times over in a single scene, decided to keep them all in the draft. I would have expected an editor to rein in this nonsense a bit. The dialogue also tends to meander a little, sometimes modern, sometimes in noble fair folk speech pattern, sometimes in enigmatic mode... the characters do not feel like they are quite settled, yet. As well done as the story is, the repetitive streak, occasional stylistic inconsistencies, and sometimes clunky descriptions let the book down - all things that a good editor should have polished away before sending the book to the printers. As it is, this is an enjoyable read, and one I would recommend to people who like urban fantasy novels, London, or novels about the Fair Folk, but it falls a bit short of the highest standards / benchmarks. I wouldn't really recommend it to people who are not already fans of (urban) fantasy - it could have been on a par with the best, but as it is, it's just a bit too rough and unpolished.